We're barely into 2012, and already RPG fans have had quite a bit of good news. Path of Exile, The Age of Decadence, Mass Effect 3, Kingdoms of Amalur, The Banner Saga, Wasteland 2, and more games are either on shelves or on the horizon. However, it's safe to say that such a list wouldn't be complete without Almost Human's Legend of Grimrock, the long-awaited spiritual follow-up to classic dungeon-crawling RPGs like Eye of the Beholder and Dungeon Master. In addition to bringing back a style of gameplay that had all but left the world, Grimrock has been spruced up thanks to the improvements modern technology can provide. While it's hard to live up to quite so much hype, Legend of Grimrock succeeds on its promise of old-school gaming about as well, fitting the mold pretty much to a T. However, thanks to its technological advancements, it also manages to introduce a few new game elements that simply weren't possible back in the day. The end result is a game that plays very, very well, and while it might not have quite as much depth as those older games in some respects, it's got all the puzzle-solving, monster-slaying and secret-searching that fans fell in love with twenty years ago. Like most games of its ilk, story is not exactly at the forefront of Grimrock's experience. Taking on the role of four prisoners (either pre-selected or fully customized), and accused of horrible crimes (the details are left to your imagination), you are thrown into the bowels of Mount Grimrock. As its name implies, it's a foul place replete with, well, grimness, darkness, and so forth. It seems the rulers of the land are compassionate, however: should you manage to reach the bottom of the mountain and make it out alive, your heroes will be granted an official pardon. This story does continue during the gameplay a little, in the form of mysterious dreams triggered when your party rests, notes left behind by a previous resident of the dungeon, and what can generously be called a "plot twist", but don't expect any character interaction to speak of. Many, of course, would say that's for the best. 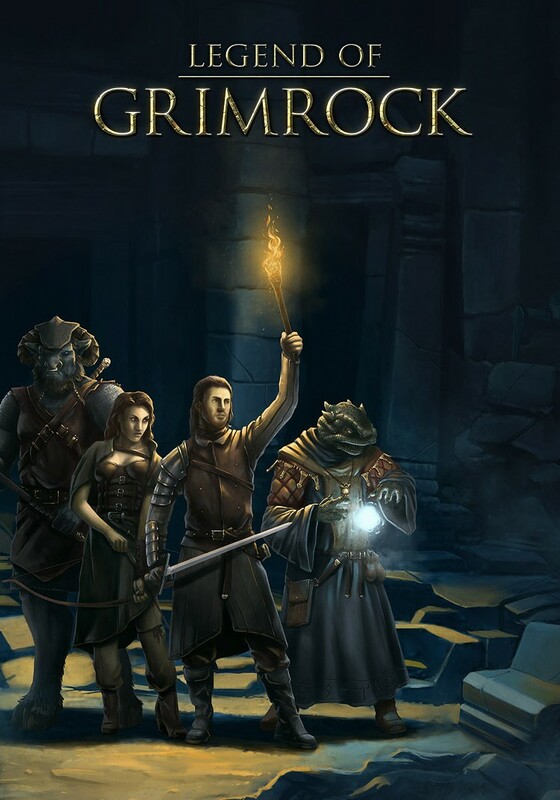 Gameplay in Grimrock is, like its forefathers, relatively simple and straightforward - make your way in first-person through the grid-based dungeon levels, fighting off monsters and solving increasingly devious puzzles along the way. The game plays out fully in real-time, but still manages a turn-based "feel" due to cooldowns on spells and attacks, as well as the grid-style movement. Even the interface is a near carbon copy of Eye of the Beholder's, with right-clicking on weapons triggering attacks and left-clicking interacting with the environment. Grimrock's combat is quite bare-bones, mostly consisting of dodging attacks while hacking away when you're able, but it's made more interesting by its enemy variety. The selection across the game is pretty good, with no palette swaps to speak of, and a fair range of different types, many of which have resistances and weaknesses to certain types of damage. There is remarkably little filler, with few to no respawning monsters to be found (except for where it's necessary to complete a puzzle), and many of the encounters are very difficult, especially when fighting new enemies (which you'll see all the way to the end of the game). Due to the grid-based nature of the game, often you're your own worst enemy - getting trapped in a corner or falling down a pit can be far more deadly than any monster on its own, and the toughest combat encounters prey on this. Where Legend of Grimrock deviates a little from its predecessors is in the potential its 3D game engine offers, mostly in its puzzles. While everything moves on a grid, there are a lot of timing-based puzzles, pattern memorization, manipulating other objects as they move in 3D space, and so forth. This is a refreshing improvement in my opinion, as it gets away from the "use X item with Y" or "press X switches in Y order" trial-and-error design (though you'll find some of those as well). It does, however, make combat a little easy sometimes, especially against single enemies - you can usually just move in circles and whack at them, always one step ahead. In fact, puzzles are really at the forefront of Grimrock. Sure, character building, managing food, and fighting monsters are all there, but it's the puzzles that make Grimrock truly memorable and enjoyable. Some of them get extremely difficult too, both in executing them and in figuring out what to do, and they occasionally take place across multiple dungeon floors, use misdirection, or play with your expectations. There were more than a few times where I had to just shut the game off, wait a few hours and come back with my mind fresh. This is the best kind of hard, I think - the sort where the answer always comes at you just when you're about to give up in frustration, but always feels satisfyingly earned in the end. Between a choice of Human, Minotaur, Lizardman and Insectoid races, and Fighter, Rogue and Mage character classes, character creation or building doesn't have quite the depth of some other systems, but it's more than enough to sustain the gameplay. Characters don't raise attributes directly; rather, skills grant attribute bonuses at predefined levels, along with unique perks, so specializing won't leave you entirely crippled. There is a decent selection of skills and traits throughout, with 6 skills per class and 14 traits (2 are race-exclusive), but the traits themselves aren't quite as drastic as what you'd find in, say, Fallout. Most of them boil down to elemental resistances, health boosts, and extra skill points rather than anything too game-changing. The leveling process is a bit more interesting. Because all skill branches give compelling bonuses, and your skill point supply is fairly limited, you must either be a specialist or Jack-of-all-trades. While the high-level abilities found at the top of each skill tree are very compelling (such as attacks bypassing armor), they are very hard to reach without completely ignoring other trees, making the min-maxer a bit more vulnerable than in some other games. Mages, meanwhile, can only learn spells in trees they've invested in, so chances are you'll only have access to a handful of them over the course of the game. I had my Mage specialize in Fire Magic, but he was completely useless when coming across some Fire Elementals later on, for example. Of course, it wouldn't be a dungeon crawler without equipment and other loot, and Grimrock mostly shines here. Like many classic games, there isn't any sort of item lottery. New weapons and armor, when you find them, are usually very substantial improvements, and often you'll find yourself with less-than-ideal equipment, especially if you try rushing ahead to lower levels of the dungeon, without necessarily feeling completely incapable either. There are a handful of unique items and set items, as well, like the Lurker outfit that's ideal for Rogues, but they are few and far between. However, the balance, as good as it is, could be a little better. I found only one necklace that was actually useful, for example, and there weren't nearly as many high-level axes and maces as there were swords. I had no trouble finishing the game with what I had, but I did feel just a little let down by specializing in certain weapon types.